What might a book that purports to be “unafraid and triumphant” look like, how might it read? The editors of Octopus and Tin House describe Brandon Shimoda’s book this way, and there are a plethora of blurbs in the book’s two covers. My favorite is this one, by the poet Brenda Ijima: “Brandon Shimoda has she-she’d a crèche of earthly delights vastly libidinal: ravishing, ceremonial word formations, not withstanding the presence of wrath like a raw cake, sponging.” This much, I fear (or, in alternate moods, hope) is true of the book itself. Another blurb, this time from the poet Nathaniel Tarn: “UNITED SHIMODA IS UNITING THE WORLD.” Again, largely true, if a bit exaggerated. 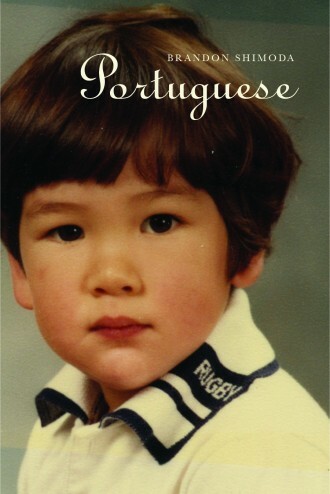 To speak of Portuguese at all is to begin to frame it, somehow, within its own landscape, which is nearly impossible to do and make writing about the book a difficult task, at least for me. What can, or ought, I say? This book is sprawling, and indeed, it is “united” in the sense that there’s no proper divided subject here to reckon with. When I went through Portuguese at first, I underlined phrases, with the notes: “comment on this.” So I’ll try to present as best I can these verses that I’ve marked, in the sense that to criticize would be too daunting for me, but to look at the way the book is structured and what it means to the reader might be partly manageable. Portuguese is not set up in any sectioned form, and yet there are themes that resonate. “For the People” continues to reoccur, and this is where the book is, I suppose, as Tarn writes, “UNITED.” One gets the sense that this book wants, very much, to write what I call “the whole poem,” that it is unabashed, and that its desire to move forward and address as many different readers as possible within a relatively short frame is one of the things that makes reading this book breathless. It sprawls, and it moves rather quickly. Here we have, in truth, “pure” (or should I say “impure?”) poetry, a sense of what it might mean to write a book that is, indeed, young oil, which stays young, hardly ever bearing the marks of age. This is what this book mirrors for us—this intensity and heat of day that may soon fade. This mirror has various effects, and one of them is to cause reflection in the reader, to make the reader want to know what, indeed, “poetry” is, and how it manages to live in the daily world. It’s a trip; it’s a long ride, indeed. If, as Shimoda writes, “we cannot all be rocks in heaven,” then this book shows us what a rock in heaven might look like, and there’s something nice about leaving the book behind to reflect on what the possibilities of an earthly life might look like. Portuguese is available from Octopus or Tin House.